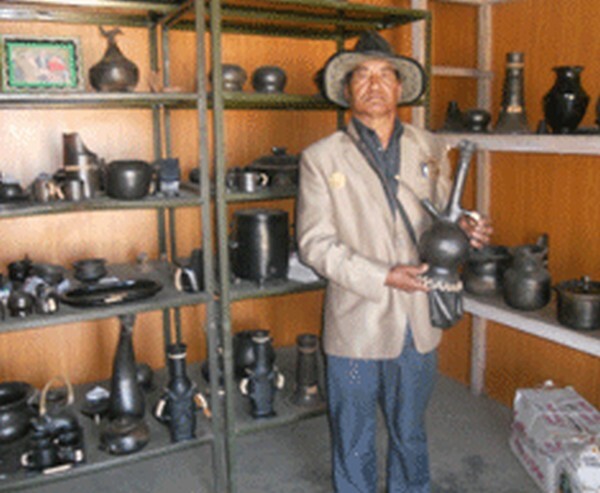 Ukhrul, January 18 2014 : The pot making skill of Nungbi villa-gers in Ukhrul district has not only earned them bread and butter but also accolades at the State and national levels. The distinctive Tangkhul earthern ceramics clay pots made in Nungbi village have dual purposes � used as crockery items and decoration pieces for the elites. Since time immemorial, the Nungbi hand-made clay pots were the only kitchen wares in Tang-khul households. Nungbi village is located 50 kilometres from here away from the polluted air of the township. Known locally as Nungbi Hum, the environmentally friendly pots are used for cooking Tangkhul traditional cuisine (special Tangkhul recipes) particularly during pu- blic feast like marriage or other festivities. The art of making the clay pots were in-herited from their forefathers and the villagers still keep the flames alive. They manufacture variety of pottery wares such as cup, bowl, utensil, jug, food container, food plate, kettle, beer mug, and decorative items like flower vase, designed urn etc in different sizes and shapes. Meet potter Machihan Sasa of Nungbi village, who perfects the pottery making skill of the villagers and under whose able craftsmanship the Nungbi Hum got recommendation of the GSI as one of the best ceramic clay found in the country. Machihan Sasa took up the profession of pottery making at a young age of 20 . Inheriting the skill from his parents, he worked hard to nur- ture his skill. "Hard work and sincere dedication to the profession has not only gave me the sense of satisfaction. It was in acknowledgement of my tireless efforts with that needed sense of enthusiasm I was conferred the National Award for Craftsmanship in 1987 by none other that the then President of India, R Venkataraman," Sasa told The Sangai Express. To his credit, he was awarded the prestigious Shilpa Gurung Gold medal award by the Ministry of Textiles, Government of India in 2009.Significantly, he was selected among 11 aspirants for the Gold medal award. He was conferred 82 awards and certificates besides 16 gold medals in the national level. Apart from making pots, Sasa, son of a potter (L) Kuisom Sasa, imparted training to the villagers in pottery from 1987 to 2011 . Two of his prentices�Yaomi Sasa and Diamond Luiram, were also conferred a national award in 1998 in 2002 respectively. Most of his local pupils were recipients of State Handicraft and Craftsman awards. His skill and achievement in making clay artefacts was matchless. All of his three sons�Phaningpam Sasa, Somi Sasa, Matthew Sasa and a daughter Wonyao followed his footsteps. All of them have won awards in the state and national levels for handicraft and craftsmanship. His youngest son, Matthew owned Pottery and Handicraft Emporium in Delhi and exported the Nungbi hum to other cities like Bangalore, Mumbai even crossing the border of Thailand. "We could not meet the growing demands of our products," Sasa told TSE. Not surprisingly, the method of making pot is still to say the least, primitive: only one crusher machine has been installed with the Govt's assistance. The potters have to queue for crushing the serpentine rock or otherwise they have to grind the rock by themselves. The fine-grained rock has to be mixed with clay called Humnal (weathered rock) . The villagers said they would be able to meet the growing demand only when more crusher machines and heating house are installed. After moulding the clay to desire shape and design it has to be heated to at least 900 degree centigrade for about 5-9 hours. "Improvement of road connectivity will really be a boon in marketing of Nungbi hum," a villager said. The finished Nungbi clay pot has to be rubbed with a local plant leaf called Chrona to make it shine and increase the lustre before it is put ready for use. "Though durability cannot equate with the metal utensil, the cuisine prepared from the Nungpi hum has no matching taste and palatability than other ceramic pot or metal utensil etc," a village elder said. "Even the rotting process of cooked food is said to be slower when compared with metal utensils," he added. While smaller lustre pots are also used for decorative purpose, the bigger ones are used best for brewing local rice beer, fermentation etc, according to the locals. According to GSI report the serpentinite rock found at Nungbi village is best for making ceramics clay pot.